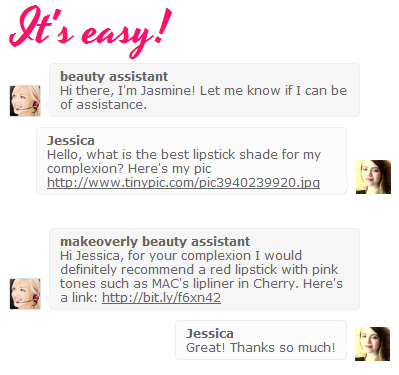 Beautiful Incentives: Get an online Virtual Makeover FREE with Makeoverly! Get an online Virtual Makeover FREE with Makeoverly! This post is brought to you by Makeoverly. This is 100% my opinion. How many of you are sick of going to the cosmetics counter only to have your face scrutinized. Then told you need such and such products. Ultimately, to be pressured into buying makeup or face product you probably don't need? Yes, they can't help but do their job, but you can help how you get service. Makeup sales women can be very helpful, but also very pushy. You want a professional take from someone who knows what they are talking about, but where else can you go besides a pricey cosmetologist or salon? I've been there, we have all been there and today I'm going to introduce a new concept that can prevent this hassle. It's called a virtual makeover. You're probably thinking this involves a program where you alter your look on your own, but it's not! Sure you can play with color palettes and hair dos with a picture, but how far does that get you? Why do all that work when certified makeup professionals can give you honest and detailed advice about what looks best on you! Often times, we are just too undecided and a fresh pair of eyes can really help with the process. A FREE service that offers real opinions from real cosmetologists and sales girls who have had a lot of experience behind the counter, with hair and makeup. Makeoverly promises that everyone is perfectly qualified from experience for the task. They offer professionals from all around the country. They make it incredibly simple. Through live chat, you can provide a link to your picture or just describe your features, such as complexion and eye color. Then, you can ask a specific question. Just go to the bottom right corner of their home page, where you'll see a tab that says "Get started. Chat now!" and click to let the instant advice giving begin! Essentially, this is like your best friend giving you advice, without the candy coating. They will tell you what looks best on you. Most importantly, they are not selling any products, nor will they push specific products! They will give you ideas on where to shop, but that's as far as it goes. Say you're shopping alone and you're getting ready for a big date and you can't get to a computer. You need advice quick. No problem woman, get on your trusty phonepanion and get on that live chat! (most mobile phones are compatible) You could upload a clear pic of your face without makeup prior to shopping. Then link it so that when you get on chat, you can effortlessly link the professional and get fast advice while out and about. If this is not ideal, just get the advice via your home computer, prior to shopping! Did you catch the best part? It's FREE! To learn more about Makeoverly, visit their website and try it out! They are waiting to solve your makeup woes. You can also tweet them. They tweet a lot of fashion and makeup updates. Perfect for fresh ideas for the new season! I am so clueless when it comes to makeup so this would be perfect for me! Thanks!